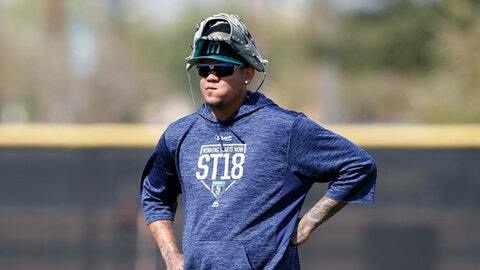 PEORIA, Ariz. (AP) During a spring training that’s been filled with small nagging injuries, the Seattle Mariners believe they caught a fortunate break after Felix Hernandez took a line drive off his right arm. Hernandez said Tuesday he is still very sore a day after a liner off the bat of the Chicago Cubs’ Victor Caratini hit Hernandez in the right forearm. The injury happened in Hernandez’s first spring training start and left the right-hander feeling pain he’s rarely felt in his career. ”That hurt real bad. I can’t explain how bad it was. I didn’t feel anything like that before,” Hernandez said. Hernandez was in too much pain to do anything but walk around in complete discomfort. Hernandez went down to a knee, hopped up and eventually was helped to the dugout with a trainer holding his arm. While it looked significant initially, X-rays were negative. The ball caught Hernandez just below his right elbow, hitting directly on a star tattoo with `13′ on the inside, signifying his All-Star Game selection in 2013. Hernandez was still unable to fully straighten his right arm when he arrived in the clubhouse Tuesday morning because of the swelling in the area around his elbow. Hernandez said Caratini reached out to him via social media. ”He sent me a DM on Instragram and (told) me he was sorry. I told him don’t worry about it and don’t try and hit it so hard up the middle,” Hernandez said. It’s another setback for the Mariners, who have already seen issues pop up with expected starting first baseman Ryon Healy (hand surgery), pitcher Erasmo Ramirez (lat strain) and outfielder Mitch Haniger (hand). Hernandez believed he would still be ready for the start of the season, saying he’ll start throwing as soon as he’s cleared. But even a brief delay in his workload during spring training is a departure from what the Mariners planned. ”I was feeling really good yesterday. I was throwing the ball really good up to that,” Hernandez said. Seattle manager Scott Servais agreed with Hernandez’s assessment of his performance prior to the injury. ”I thought he was throwing strikes. I thought he was aggressive. His stuff was plenty good. It was trending all in an upward trajectory until the line drive happened,” Servais said. Hernandez being on the mound so early into Cactus League games was a drastic departure from the past. In previous years, Hernandez was eased into the spring training routine. He typically wouldn’t pitch his first game until the first week of March and often worked on back fields against minor league opponents. This spring training was different. He threw a bullpen on the third day of camp and made his Cactus League debut in Seattle’s fourth game. The plan was an increased workload so Hernandez would have proven he was ready by the start of the regular season. ”From where he was at mentally, from how he was going about his workouts, how he has changed some things, I think he was looking forward to it, to pitching more frequently,” Servais said.